Osram Opto Semiconductors GmbH, Regensburg, is a wholly owned subsidiary of OSRAM, a leading supplier and manufacturer of lighting solutions who employs more than 35,000 people throughout the world. OSRAM released the world's first OLED lamp back in 2008, but this was more of a prototype than a commercial product. In November 2009 they have started to ship their first OLED lighting panel, the ORBEOS, and here's our hands-on review of those panels. In 2014 or so OSRAM shifted its OLED lighting focus to the automotive market. 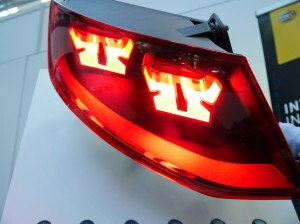 OSRAM was the first company to supply OLED lighting panels for serially produced cars as it supplies the OLEDs for BMW's M4 GTS taillights and also the OLED lighting in Audi's TT RS Coupe 2016. In 2018 OSRAM decided to pull out of the OLED lighting market. The company will continue to provide product support for both automakers until 2020, and will continue to monitor the market. OSRAM used to offer PMOLED display panels (under the Pictiva brand), but this is now discontinued. Audi announced a special limited (999 total) 20th anniversary edition of its TT sports coupe - which will sport OLED taillights - similar to the ones Audi adopted in its 2016 Audi TT RS. The OLED used in the 2016 TT RS were produced by OSRAM. In April 2018 OSRAM announced it is pulling out of the OLED lighting market, but it will continue to support its customers until 2020, so it's likely that these new OLED modules will also be provided by OSRAM. Is OSRAM pulling out of the OLED lighting market? One of our readers reported that during the Light + Building trade show earlier this month, an OSRAM official said that OSRAM is pulling out of the OLED lighting market, and the company will stop all OLED R&D immediately. This is very unfortunate news. OSRAM is the supplier of OLED Lighting panels to Audi and BMW, and according to the OSRAM official the company will continue to provide product support for both automakers until 2020. Ten Germany-based companies established a new OLED lighting alliance, called the "OLED Licht Forum" that aim to develop and promote OLED lighting technologies through dialogue and expert exchange. The forum will also organize conferences, lectures and institution visits. The forum was founded by OLEDWorks, OSRAM, Merck, BASF coatings, EMDE, Fraunhofer, Hema electronic, Irlbacher, APEVA and WALO-TL. One of the first activities will be to create an OLED showroom in Germany that will be open to the public. Germany launched a new project led by Merck to develop quantum materials as light emissive sources. The three-year project is called "Exploration of quantum materials – New paths to realizing innovative optoelectronic components" (ELQ-LED) and it is supported by the German Federal Ministry of Education and Research (BMBF) and led by Merck with an aim to conduct basic research on quantum materials as light emitting sources. ELQ-LED is a three-year project that will end on the summer of 2020. Merck hopes that ELQ-LED materials will enable ultra-pure colors, higher energy efficiency and lower production costs compared to current OLED emitters. The focus of this project will be on cadmium-free quantum materials but the partners will also develop supporting components, processes, transport materials and ink. All components developed in this project will be printable, and the project will test its developments in display prototypes and automotive tail light demonstrators. In 2015 the EU launched a 3-year €4 million OLED lighting project, the LEO project (Low-cost / energy Efficient OLEDs) that had an aim to develop efficient and cost-effective bendable OLED lighting technologies. The project consortium included Osram, and Cynora. A month before the project officially ends, the partners updated on their progress. For this project, the partners develops several technologies, including low-cost metal foils integrating OLED anodes and possibly backside monitoring printed circuits, smart OLED top-electrode architectures and light out-coupling solutions and a novel thin film top-encapsulation strategies. These technologies together increased the light output by 50% while providing better surface scratch resistance. In July 2017 Audi unveiled its flagship luxuries sedan, the 2018 Audi A8, which uses OLED taillights. Hopefully the A8 is Audi's first car with OLED panels in all versions (the 2016 TT RS also has OLED lighting, but these were optional). Audi did not yet reveal the specification of these OLEDs, but now it has released the image above which shows the structure. The A8 uses four OLED modules on each side , each with what seems to be 6 different structured panels, a large red one and five yellow ones which form the turn indicators. In April 2016 Audi unveiled its 2016 TT RS coupe - with optional OLED taillights. This is the world's first serially-produced car to have OLED taillights, and up until now we did not know the lighting producer (it was rumored to be LGD, but that was later denied). 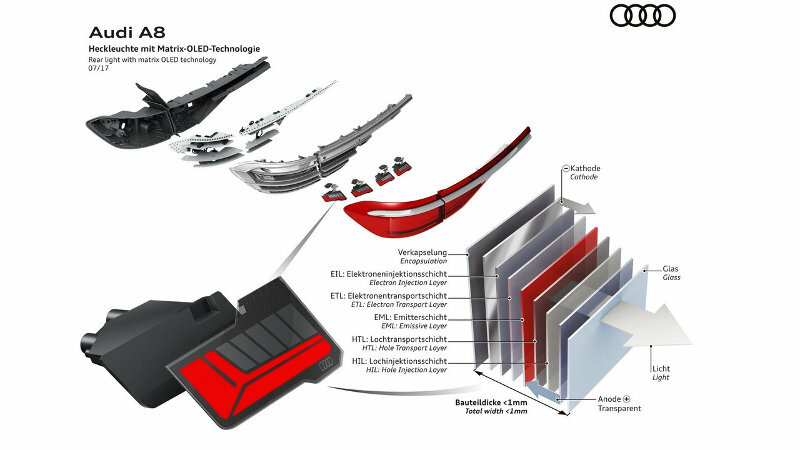 Today Osram revealed that it is producing those OLED lighting panels for Audi. Osram also reveals that each module contains four patterned OLED panels with a total light-emitting area of 49 cm2 and a brightness of 1,000 cd/m2. The module is mounted on a holder with a mirrored bezel, guaranteeing optimum visibility on the road. In October 2013, the German Federal Ministry of Education and Research (BMBF) launched a new flexible OLED lighting project called R2D2 with an aim to investigate new production technologies, including roll-to-roll techniques. R2D2's coordinator Fraunhofer FEP, now reports that the project has been successfully completed. OLED production processes and market sectors were thoroughly analyzed, the potential for improvement was identified and realized. The project partners developed a series of OLED lighting applications combining special design features with efficient fabrication techniques. OSRAM says that their automotive OLED lighting panels will enter mass production in early 2016. 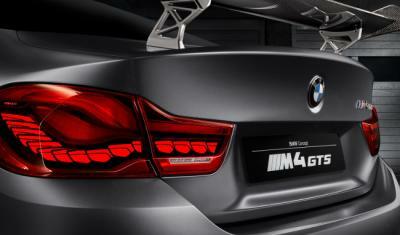 OSRAM is the OLED supplier of BMW's M4 GTS taillights. The M4 GTS will enter limited-edition (700 units) production and may be considered the first commercial car with OLED lighting. Universal Display announced that it signed a collaboration and evaluation agreement with OSRAM. OSRAM will begin to sample UDC's PHOLED OLED materials for OLED lighting applications. OSRAM is mostly focused on OLED for the automotive market, and the company recently announced a five-year strategic plan that includes a €2 billion investment in current and future lighting applications - which includes OLEDs for the automotive market. The company's CEO considers OLED important for some niches, but too expensive for general lighting.